It’s the beginning of January and I want to wish you all a Happy New Year. You may want to kick off the new year with our Start a Blog Course. In today’s episode we are continuing our series of blogger stories where I’m handing the podcast over to you as listeners to tell your stories and tips of starting and growing your blogs. Kristen Manieri from Orlando, Florida started a blog with no real plan to make money. Kristen writes about dating ideas of a particular location and her blog has grown to the point where she is making over $100,000 in advertising. Darren: Hey there, it’s Darren from ProBlogger. Welcome to Episode 226 of the ProBlogger podcast. ProBlogger is a blog, a podcast, event, job board, a series of ebooks, and soon to be a course all designed to help you to start an amazing blog, to create a blog with great content that’s going to serve your audience, and to build some profit around that blog as well. You can learn more about ProBlogger over at problogger.com. It is the first of January as this episode goes live. I do want to pause and wish you all a very Happy New Year. I hope you had a good holiday period, no matter what you did, and ready and raring to go for a great year of blogging ahead. We’ve got a massive amount planned for you this year. Starting on the 10th of January, with our new course, The Ultimate Guide To Starting A Blog, which is a seven-step guide to starting a blog that has the foundations to be profitable. We want to talk you through how to set up a blog but we want to take you a little bit back from that and get you starting a blog that’s on the right topic and is well-thought through in terms of what you’re going to be creating. That starts on the 10th of January. If you head over to problogger.com/startablog, you will have an opportunity there to reserve your spot in that course, it’s a free course, and be notified when that goes live. Today, we are continuing our series of blogger stories where I’m handing the podcast over to you, as listeners, to tell your stories of starting a blog. It’s all about trying to inspire as many people as possible to start and grow their blogs in 2018. Today’s story is an amazing one. It’s of a blogger who started a blog about dating and dating ideas in a particular location. She has grown that blog, which started as a passion project, with no real intent of making money. She’s over the years built that up to the point where it’s making over $100,000 a year in advertising just on writing on dating ideas for a particular location. She tells a little bit more about how she’s going to expand that to more than one location as well. This is a great story. I hope you enjoy it. You can find today’s show notes with all the links to our course as well as the blogger that we’re featuring today over at problogger.com/podcast/226. After she shares her story, I’ll be back to point out a few things that I love about the story and give you a few more tips of my own. Thanks for listening. Kristen: Hi, this is Kristen Manieri from Orlando, Florida. I wanted to tell you all about my blog, orlandodatenightguide.com. I started Orlando Date Night Guide in 2007. It’s a total passion project. My husband, Mark, and I just moved to Orlando the year before. I was immediately struck by how much there was to do outside of the theme parks and by how often when I would share these things with people who already lived here, even people who’d been here for five years or more, how many had never heard of them or hadn’t ever bothered to check them out. I actually started with a book that published in early 2007. Then the website launched a few months later. We just celebrated our 10th anniversary. Honestly when I started, it was just because I thought how great is this that I can write something and take some photos and hit publish. I was a freelance writer from my paid work. To have the freedom to write about what I wanted, when I wanted was really exciting and rewarding for me. In 2011 though, I decided it was time to take it a little more seriously, and I started writing more consistently, and I launched all of my social media accounts. But in 2014, I realized it was time to monetize. I teamed up with someone who sold ads locally. We created ad spots on the site. We now generate just short of about $100,000 a year in ad revenue from local businesses. In hindsight, what did you do in starting your blog that you’re most grateful for that you did? I think for me was that I started it without thinking that I was going to make a whole bunch of money from it. I really just started it because it was something that I wanted to do and that I loved to do. Because I did it with making no money for seven years, I don’t know that I would recommend doing that. I think I probably could’ve monetized it a lot sooner. There was no pressure up until that point. I could just have fun with it and really dive into the passion side of it before I started trying to turn it into a business. I think trying to turn a blog into a business too early can make it too stressful. If you were to ask me about my dream for the blog, it would’ve been to have it grow outside of Orlando. Earlier this year I actually saw that dream come true with the launch of Tampa Date Night Guide, Asheville Date Night Guide, and our national site Date Night Guide. We’re also launching in Baton Rouge in the first quarter of 2018. Few good things have had happened since I started my blog is definitely growing outside of Orlando, that’s been super exciting. But I was also voted best blogger by Orlando Magazine last year. Through the blog I launched an event series called Do Good Date Night where we pair couples with local nonprofits for volunteer date nights. A series was featured in Good Housekeeping magazine earlier this year. That was really cool. I’d been growing to over 60,000 social media followers and over 50,000 monthly readers who’s been pretty awesome. Also growing my team has been really great too. I’ve got such a great group of writers that work with me to create what we create everyday. My number one tip for new bloggers, I think when you’re just starting out a new blog you should write down 100 ideas for a blog post, no less. Before you even create your site, get your URL, make a giant list of 100 things that you’d actually see yourself writing about. Then before you hit publish, before you actually start your WordPress account, write 20 of them, and see if just writing them for you lights you up enough to keep going, and if you’re actually as excited and informed about the topic as you initially thought. I’ve been writing Orlando Date Night ideas for over a decade now. Hundreds and hundreds of stories later, I still never run out of things to share or passionate about sharing them. That’s it for me. Thanks for the opportunity. 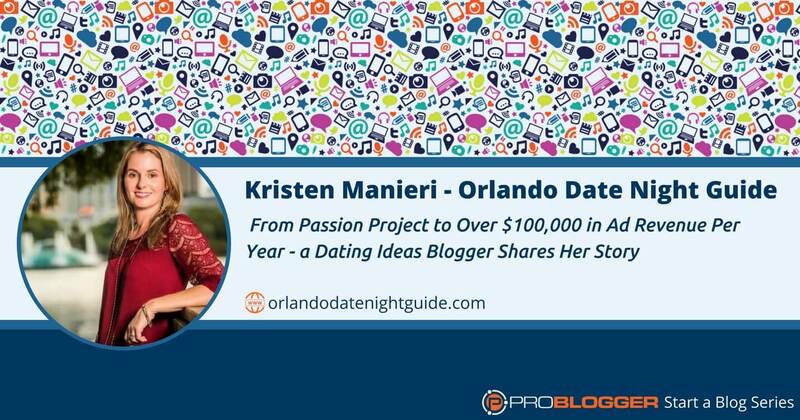 Darren: That was Kristen Manieri from Orlando Date Night Guide, great idea for a blog. I’ve seen a number of bloggers around over the years who have done similar things for their own locations. I wanted to include that particular story for a number of reasons. One, because it is possible to have a blog that is serving a particular location. You do not have to start a blog that is going to reach the whole world. In fact, you may be better positioned to really focusing on a particular niche. A niche can be a topic but it can also be a type of person, a demographic area as well. Kristen, in this case, is targeting people who might be over dating age in Orlando. I just did a Google search, Orlando has 2.3 million people. It’s a fairly large area that includes the metropolitan area, of course there are tourists coming into it as well. It’s big enough to be able to sustain almost $100,000 a year in advertising. I wanted to include that because you don’t have to have bloggers that are number one in the world. You can build a business by being the number one blog, or not even the number one blog, but a significant blog in a particular area. I love that idea. Fantastic. I love the idea that she’s also built something that can be replicated in other parts of the world as well. Really, this could be replicated in any city around the world. It looks like that the plan is to roll out quite a few of them and to try it around national level. One of the reasons that this particular strategy works very well being localized is that it is going to help to monetize it, particularly in terms of working with advertisers directly. Anyone advertising on that particular blog knows they’re going to reach people who are in Orlando and have a very niche focused: they want to have a date, they want to do something together. I think that is one reason why this works, particularly well with that advertising model as well. She also mentioned their book. I think this is another revenue stream, potentially would be those types of products that could be used by couples in that particular area, whether that be a physical book or more perhaps. I’ve seen this used on other similar blogs, PDF type things or virtual type ideas as well. I did see one person doing an app for a particular area as well that worked quite well. Fantastic story there. I love the tip that Kristen gave at the end there. Her number one tip, coming up with 100 ideas for blog posts and then writing 20. I think for me this is actually a tip that I’ve given many people over the years, whether it’s 100 or not, I think brainstorm as many topics for blog posts for content as you can before you get that domain, before you set up your blog. Because that’s going to reveal to you is your niche broad enough for you to come up with ideas. I’ve seen a number of bloggers that I suggest do this exercise realized that they could only come up with 10 to 20 topics. That showed them that their niche was too narrow. They needed to broaden it out, and perhaps thinking about more categories of topics that relate to their audience. Because they really only had enough ideas for 20 or so posts. That’s not enough. You’re going to be at this for years. I think Kristen started in 2007. She’d been at this for 10 years now. You need to do that due diligence to come up with ideas. Also it’s going to reveal by writing the content. I love that strategy of not only brainstorming the topics but actually setting yourself the task of writing 20 of them. Firstly you’re creating some great content that you can use in your launch period but also you’re going to very quickly discover whether you enjoy your topic, whether you have that interest, that passion for the topic. You’ll also have some content that you can then put a critical eye to it and ask yourself the question, “Is this any good?” Perhaps at that point, it’s also worth sharing it with some friends, with others who can give you some feedback. Do you like it? Can you sustain it? Are you good at it? These are good questions to ask before you go and register that domain, and before you go and set up that blog. Also, doing that exercise of course gives you your first 20 or so blog posts as well, which you can then use to two or three of those a week. You’ve got yourself several months worth of content there, which enables you during that launch period to get on with promoting it, building community, and networking with other bloggers. All these other things that you really need to do in those early days of blogging. Thanks so much, Kristen, for your story and for your tip. You can check her out at orlandodatenightguide.com. I think I left off the guide earlier. Thanks so much for that. Check out problogger.com/startablog for our Start A Blog course, which we’ll be launching for the first time on the 10th of January. If you’re listening to this in the months to follow, hopefully it’d still be there and you can still sign up to do that. We will be updating as we go. If you are listening to this several months later, you’re going to even get a better course. You can go there. You’ll probably be directed the way you can sign up and start up straight away. It is a seven-step course that we’re going to walk you through. It really is designed to help you make some good decisions, to have good foundations for your blog. First step is thinking about is a blog right for you, thinking about your purpose with your blog. Number two is thinking about what you’re going to blog about to finding your blogging niche, making sure it’s viable. Part of that is what I was just talking about with coming out with those ideas. Number three we’re going to help you to make some good decisions about what to call your blog, what domain name to get. Number four you’re going to be walked through, step by step, how to register that domain, to setup your hosting, and how to install WordPress. That’s for technical side of things but really a lot of how to start a blog tutorial step with that. We want to get those first three steps in before you get to that point because really if you go out and get the domain and you setup your blog in WordPress before you think through some of those earlier things, you’re going to choose the wrong domain. That’s step number four. Number five is getting your blog looking good, thinking about the design and the theme choices. Step number six is adding content and functionality to your blog with WordPress. Then step number seven is a blog launch checklist, and some learning modules about email and social media. Some of those other things that you will want to set up in the early days of your blog. This is a free course, steps you through those seven things will get you from idea through the having your first blog, and having some content on it. We’ve got some other stuff that we will be throwing into the course. As well to help us celebrate all the blogs that will start as a result of it. I just checked few minutes ago, we’ve had over 100 people register in just a few hours for that course. You won’t be alone. That’s one of the great things about this particular course. We’re going to be all going through it together. There’ll be some community around it as well. Problogger.com/startablog. You can sign up to be notified when that goes live. Thanks for listening today. I look forward to chatting with you tomorrow. These stories will be coming on a daily basis for the next four more days after this, then a couple more next week as well before we start the course. Thanks for listening. The post 226: From Passion Project to Over $100,000 in Advertising Revenue – a Dating Ideas Blogger Shares Her Story appeared first on ProBlogger.